Vanilla options are an agreement between two parties that gives the buyer of the option (which will be you in almost all circumstances), the right, but not the obligation, to buy or sell one currency in exchange for another at an agreed exchange rate on a predetermined date. A premium is payable on vanilla options. The buyer of a vanilla option nominates the currency pair, expiry date, notional amount and strike rate. Smart Currency Options Limited (SCOL) will calculate a premium payable by the buyer of the vanilla option. The premium is payable within two business days unless you select a deferred premium. 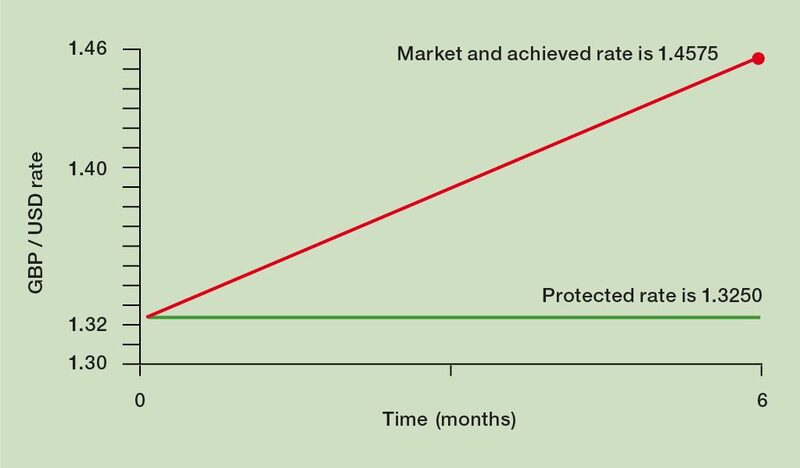 A deferred premium is one that is settled at a date beyond the usual two business days (typically upon expiry of the contract). Please note that deferred premium vanilla options are not available to all SCOL customers. The premium is to be paid in full and by the premium due date detailed in the trade confirmation. Furthermore, settlement of an exercised option is required within two business days of expiry. A UK-based company imports materials from the US and needs to pay a supplier $500,000 in six months’ time. GBP/USD weakens. At maturity, the exchange rate is 1.2500. The company is entitled to buy the full $500,000 at 1.3250. GBP/USD strengthens. At maturity, the exchange rate is 1.4575. The company lets its vanilla option expire and simply buys $500,000 at the market rate of 1.4575, thus benefiting from the 10% improvement in the currency exchange rate.